I’ve been going crazy over what dishware to use in the new place. I’ve been looking to remove as many toxins as possible from our kitchen, and our plastic dishes had to go. That’s when I found Pacific Merchants Acaciaware. Acacia (also known as thorntree), is a natural wood that is becoming trendy and popular for use in kitchenware. Historically, acacia has been a prized wood because of its beauty and strength, used as a substitute for the higher priced hardwoods. Unlike a lower priced material such as bamboo, acacia is a genuine hardwood rich with natural oils that gives it a natural water resistance. 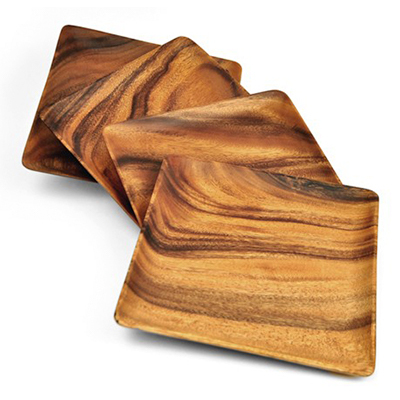 When dishes are made with acacia they withstand washing with soapy water, and don’t stain after oil is placed on them. With over 1,300 species of acacia world-wide, including Australia, Africa, North and South America, Europe and Asia, acacia is an abundant and fast growing species that is not on any endangered list (such as certain species of teak). I’m so impressed with these dishes. They’re sturdy, clean well, look beautiful and most-important, are toxin-free!